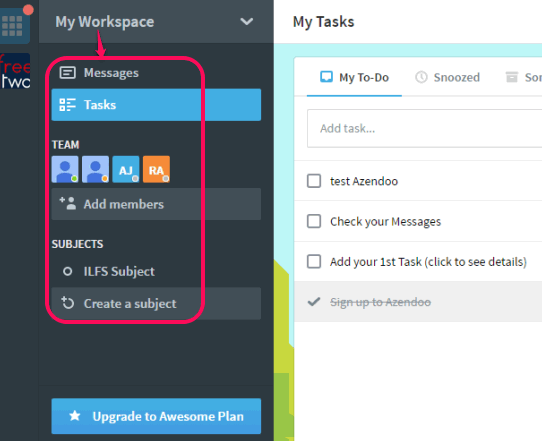 Azendoo (free subscription plan) is an online task management website that provides 10 GB shared storage space. So you and your team members can add tasks, attach files, assigns tasks to each other, create to-do lists, and send messages without worrying about the storage space. With this free plan, you can invite unlimited members to join your workspace and collaborate together. It also provides feature to integrate your cloud storage accounts. This will help you to import your tasks or projects from a preferred cloud storage service. You can integrate Google Drive, Evernote, Dropbox, Box, or Skype accounts. So many interesting features come with this website, which makes it a bit special than other similar task managers. 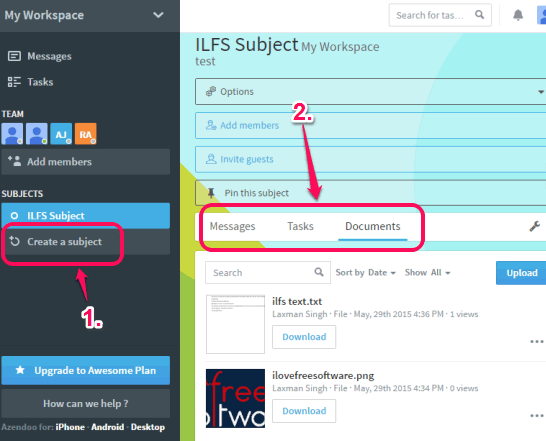 Screenshot visible below shows the dashboard of ‘My Workspace’ where all the important features are available to access and use. This free plan has many interesting features and few limitations also. For example, you can assign only once task per day to a team member, only one workspace to create and manage tasks, and can integrate only one app. If you are OK with these limitations, then free subscription plan is great for you. Or else, you can try to switch paid subscription for more benefits. You can access all important options (available under My Workspace) using the left sidebar. 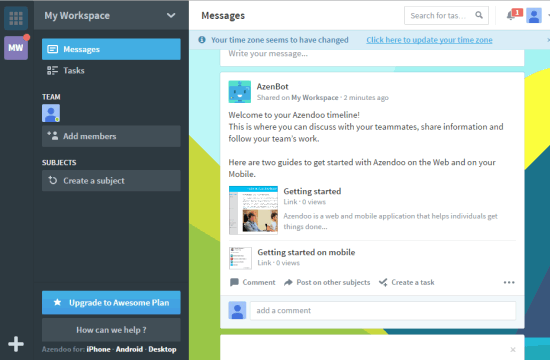 You can see all the team members, messages sent and received by you, list of all the tasks, etc. You can also create a subject for a particular purpose and invite team members to join that subject. 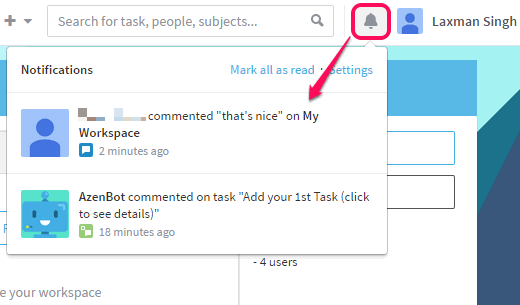 In every individual subject, you and team members can add messages, give comments on messages, add tasks, and share documents. Team members can also download the uploaded documents. You can make any team member officer or admin. You will also get notifications for any activity happening on your workspace. How To Use This Free Online Task Management Website? You first need to perform all the basic steps, like open the homepage of this website and create a free account. When you have created the account, you will immediately receive 10 GB free shared storage space. After this, you need to open dashboard of your workspace. In your workspace, start adding your to-dos using Tasks option. For every single added task, you can explore more options by hovering mouse cursor over a particular task. Whether you want to mark task as done, assign task to a person, move task for someday, or snooze a task till a particular date & time, you can use those options. When your team members will join your task or subject, they can collaborate with you to send documents, messages, and complete assigned tasks. 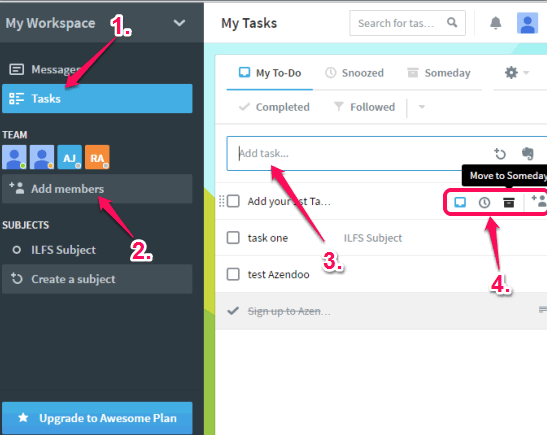 Although many other free online task management websites provide features, like add to-dos, assign task, and more, but Azendoo gives few unique features that you can enjoy without spending a penny. You should check it yourself if it can fit your needs.